In the winter, warm air from inside a building flows toward the colder outside. In the summer, hot air from outside flows toward the cooler inside. To maintain comfort, the lost heat in the winter time must be replaced by the furnace, and the gained heat in the summer must be removed by the air conditioning. Insulation reduces the heat flow between the inside and the outside, which in turn decreases the necessary run time for the furnace and air conditioning in their respective seasons. 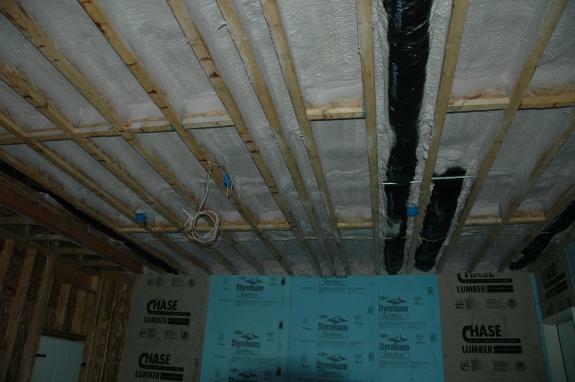 Insulation also provides some degree of air sealing, helping to prevent air flow through leaks in the structure. Not only are drafts uncomfortable, but air leaks can carry hot humid outdoor air into the house in the summer and warm moist air from a bathroom into the attic in the winter. Air that is exchanged with the outside is directly wasting the heating or cooling energy spent to condition it. The "R value" measures the effectiveness of the insulation material to resist heat transfer. The higher the R value, the less heat is transferred through it -- a higher R value is better. The US Department of Energy provides recommendations for R values based on location. We have also included in our contract with the builder to seal and caulk a whole laundry list of interior and exterior penetrations, taking language directly from the green built home checklist. In addition we avoided using any recessed "can" lights in insulated ceilings and all bathroom exhaust fans will be caulked extensively. In the ideal world, we would use spray foam insulation throughout the entire house for the ultimate in air tightness. However, this would have added around $5,000 to the insulation cost, which is not within our budget. Therefore, we are applying the foam insulation "strategically" to those places where we can mitigate the natural tendency to draw air up from the basement into the attic. Our Energy Star consultant provided advice to make these choices. Our Energy Star consultant will measure the air infiltration by performing a blower door test at the completion of the home. She has already told us specific things she will be looking for during the construction to ensure that the house is tightly sealed. Our builder has guaranteed us (in our contract) an air infiltration rate of 0.15 CFM or less per square foot (a lower number is better). This exceeds the Energy Star requirement and earns 2 points on the "green built home" checklist. We are hoping for a result of 0.10 CFM per square foot, which is good for 3 points, as the builder's "parade" home exceeded this mark.